If you live where temperatures dip below freezing at night, there’s a time every season to prepare your pool for the cold months ahead. One important step in your preparation is to cover up your pool. All-Safe is here to provide safe and functional ways to do so that will save you time, energy, and money. Here are the steps to take to make sure your pool is ready for a cold winter season. The first thing you want to do is make sure your pool is clean before closing it so it’s spotless when summer comes around. Algae and other debris can weaken the pool chemicals, pollute the water, and damage the pool. Cleaning the pool before placing a winter inground pool cover will ensure that any leftover organic matter in the water won’t lead to algae blooms. Every winter pool safety cover comes with a special chemical kit that includes borate floaters and algaecide. Many chemical packages say to add the chemicals before lowering the water, but All-Safe recommends adding the chemicals after lowering the water to maximize concentration. Once the chemicals are on the water surface, use a brush to distribute it evenly. Before installing a winter inground pool cover, make sure to balance the water’s PH with granular chlorine. It’s best to do this a week before placing your in-ground winter pool safety cover because it will ensure the PH is stable at an acceptable concentration before going unused for a few months. You want to make the sure there isn’t too much chlorine because it can weaken your pool cover. If using a cartridge filter, remove and thoroughly clean it. If you have a DE filter instead, remove and clean it, making sure to not leave any DE powder, as any powder left on the grids will clog and cause filtering problems in the spring. Once clean, keep your filter safe in the tank. Make sure the filter clamp and lid are securely in place before and after blowing the lines. Out of the entire winter preparation process, this is the most important step. Blowing out the lines ensures no water is left to damage when cold water gets hard. Make sure there is no water on any equipment and add non-toxic antifreeze to the pump lines before plugging the lines back in. The Gizzmo could effectively handle this one for you, but if that’s not good enough, try a combination of skimmers with rubber freeze plugs. They should do the job perfectly. Turn off the circuit breaker to the pump. To be safe, remove all timers on the clock just in case anyone tries to turn the circuit breaker back on during the winter. After all the work, it’s finally time to officially close your pool for winter. If you are using a winter pool safety cover, check out your All-Safe user manual for extra information. 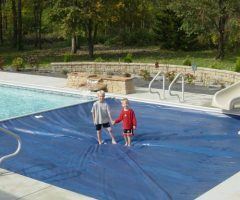 If you’re using a simple plastic winter inground pool cover, make sure there are no tears or damages. Once it’s in place, you and your swimming pool are ready for winter. Make the appropriate preparations and get an inground winter pool cover that will keep your pool safe when the snow comes down. Call your local All-Safe dealer today to schedule a free on-site consultation and start your preparations today.